Throughout history mosaics have been made from a variety of different materials, depending on the location of the project, complexity of the floor and importantly, the wealth of the patron. Limestone and marbles were typically the main stones used in mosaic workings however for different colours different resources would be used. In Britain for example there was a lack of local red stone therefore a mosaic maker would cut up and re-use terracotta tile or pot in order to get the desired colour. As well as stone it was not uncommon for glass to be used. 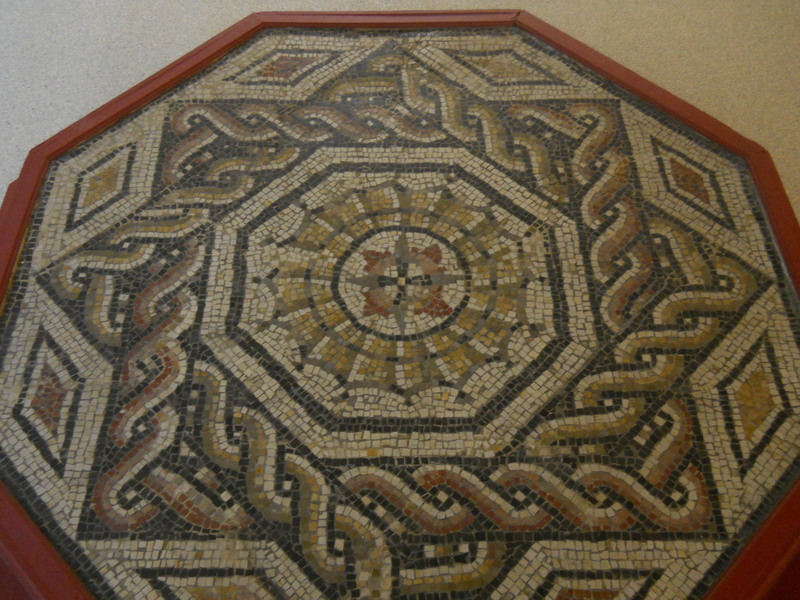 Smalto was a type of coloured glass which could be made into rods then cut by the mosaicists and put into the mosaic , this technique was sometimes used in floor mosaics although due to its brittle nature was more popular in wall mosaics as they endured less pressure and damage. The smalto was good for providing dark reds and blues and was especially effective when used in baths or fountains as it would become very bright when wet . Glass tesserae have been found in Britain but it seems in such a province it was used very rarely for only minute details such as emphasizing the green speckles in the hare at Cirencester .In wealthier provinces closer to Rome glass tesserae are known to have been used in greater quantities, however the passage of time is not kind to such mosaics. Floor mosaics generally survive better than wall mosaics as walls tend to crumble and be recycled more so than floors which get buried in earth. In elite mosaics even more luxurious materials could be used if wanted, gold and silver leaf glass were used on occasion and in some mosaics precious gems and jewels were used to highlight a detail. The inclusion of such expensive materials would have often been a minority component of mosaics; on the whole the predominant material was limestone and marble. The ways in which the mosaic makers got these materials is not completely clear. It is believed that some of the stone for mosaic building would have came from the waste products of stone masons as their sizeable waste could have been gathered cheaply and cut down to the appropriate sized tesserae for the planned mosaic. However if a mosaic was to include richer colours than the black and white stone traditionally handled by a typical stone mason then they would have to be sourced specially and thus become more expensive. Another problem with sourcing stone for mosaic construction is that stone in any significant quantity is a heavy commodity to transport so unless the mosaic site was fortunate enough to be situated near the stone source or a port where it could be imported via the sea, it would become costly or limited in its colour. Once the mosaic workers had the relevant materials, they had to cut them to the required shape. How they did this is still questionable however it is thought that they would have used a small anvil such as with glass tesserae and cut them using a knapping blade. The main evidence for this is that this is the traditional technique that society has inherited from the past and that a Roman funeral monument displays what is believed to be a workshop of sorts, in which stone is being cut into tesserae, loaded in baskets and carried away. Presumably the men working the stone into manageable tesserae would also go on to lay the mosaic itself however this is not explicitly clear, although it would seem the more likely and sensible way to maintain a mosaic workshop, especially as additional shaping of the tesserae may be required at the site. Nevertheless the evidence for the actual production and the organisation of the industry is sparse so such conjectures remain.